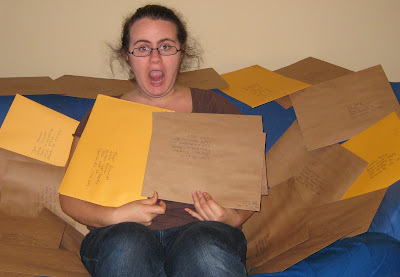 Above: Surrounded by my mountain of mailouts. A month ago I got the news: my incredibly stable stage management gig that I'd had for the past two seasons wasn't going to be quite so stable next year. In fact, I'm going down to only two shows at Pacific Theatre. It's partly my choice & partly due to a slightly scaled back season. I'd been lucky. I've only been out of university for two years, and I've had steady theatre work since before I graduated. All of a sudden I found myself in the position that everyone in the world hates: needing to find a job. So I spent this whole week preparing for that. Updating my resume, researching theatre companies throughout BC & Alberta, writing cover letters, getting references & finally addressing envelopes. It took all week. But it's done. The envelopes are in the mail now & it's finally all out of my hands...Or at least until I start follow up in two weeks. Indeed, not for Wuss's. But you look as though you are on top of the mountain and not it on top of you. Break a leg with the job-hunting! You're a Stage Manager. Trust me, you will never have trouble finding work. Haha, greatest picture ever. Make sure you get a job in Edmonton or I'll find a new adopted sister. Everyone needs a good stage manager...no doubt you'll find something fun, good luck! And that picture pretty much describes my life on a daily basis...I love it! Thanks for the good wishes, all! I'm very hopeful that something good will come of it it all.